If you could see me today you would notice a huge smile. Not only is it the first day of spring- the days are getting noticeably lighter- but it is also my youngest daughter’s birthday. 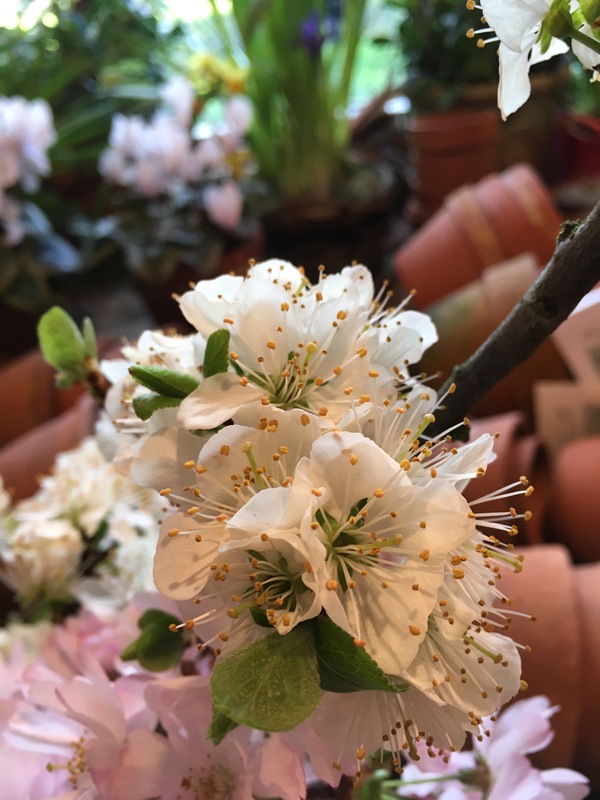 So for this happy day, I have dashed around the garden picking spring flowers and blossom to fill the house with colour and scent. I always put cherry blossom in every room for my daughter’s special day. 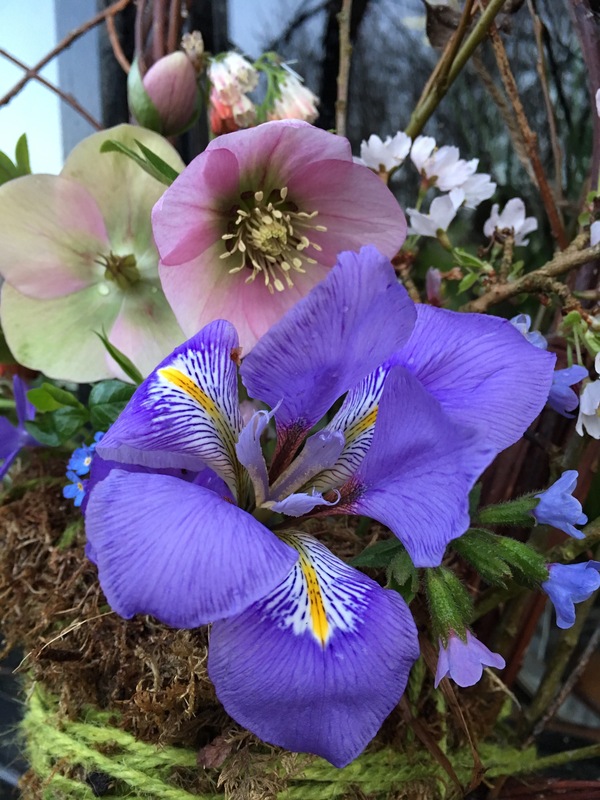 There’s little pots of scented violets and wild primroses on all the windowsills. And for the front door I’ve made a willow kokedama bouquet. 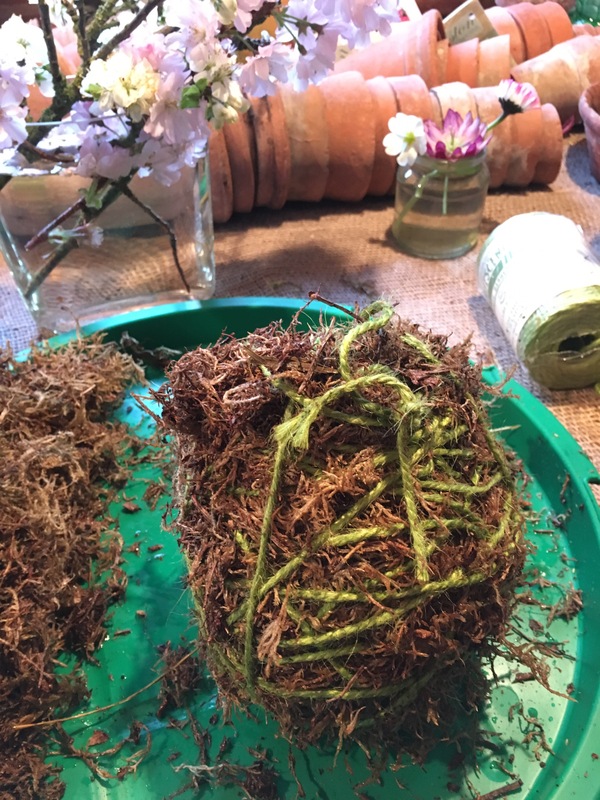 The “ingredients” for the kokedama comprise a willow heart I made last winter, a cut down plastic juice bottle, some moss from the garden and some twine. I spotted this idea at Easton Walled Gardens last month. Snowdops wrapped in moss and twine made strikingly beautiful displays. I made a note of how they were put together. Here’s my ingredients in the potting shed. I used a Robinsons juice bottle cut down to 10cm for a vase and some lime green Nutscene heritage twine. I made a nest around the vase with wet moss, and simply wrapped back and forth until the moss was secured. It was much easier than I expected, and only took a few minutes to make. 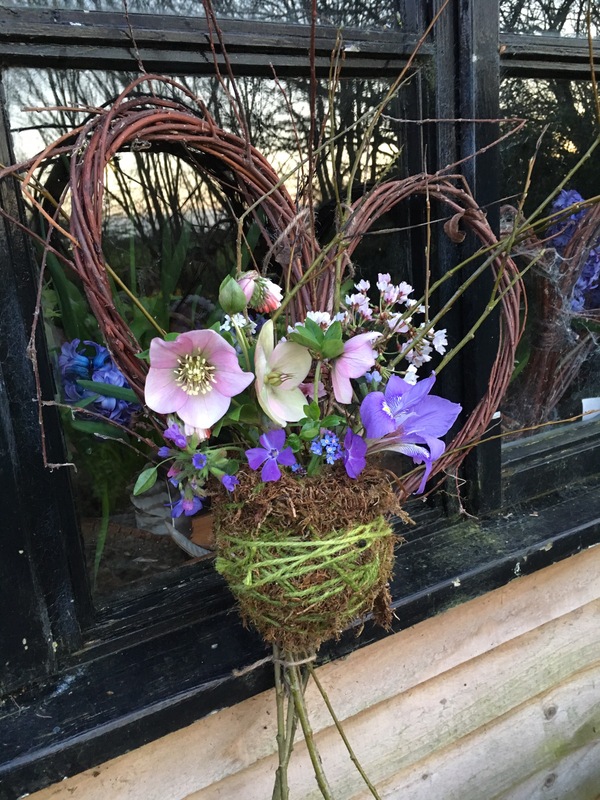 The vase was easily tied to the front of the willow heart. 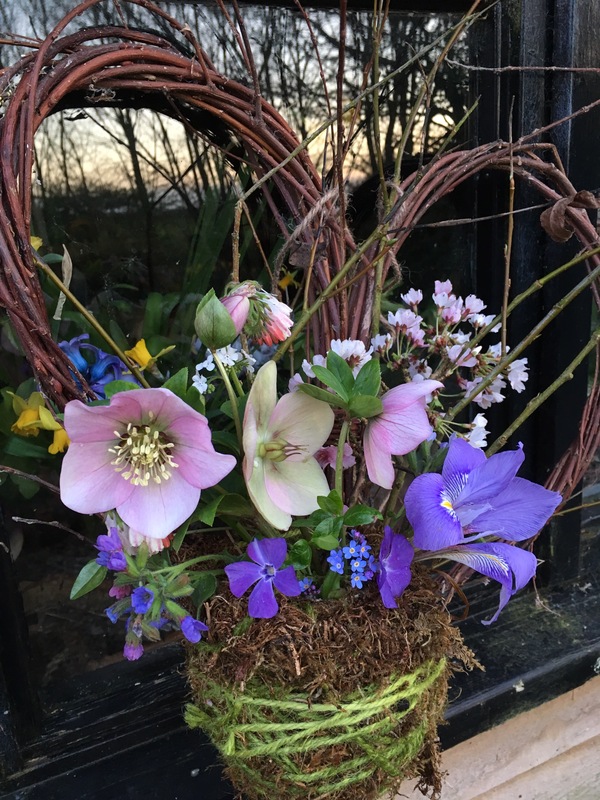 The mossy vase was packed with winter- flowering Algerian Iris Unguicularis, hellebore Ashwood hybrids, pulmonaria, comfrey, fogetmenot, Prunus Kojo no Mai and vinca. 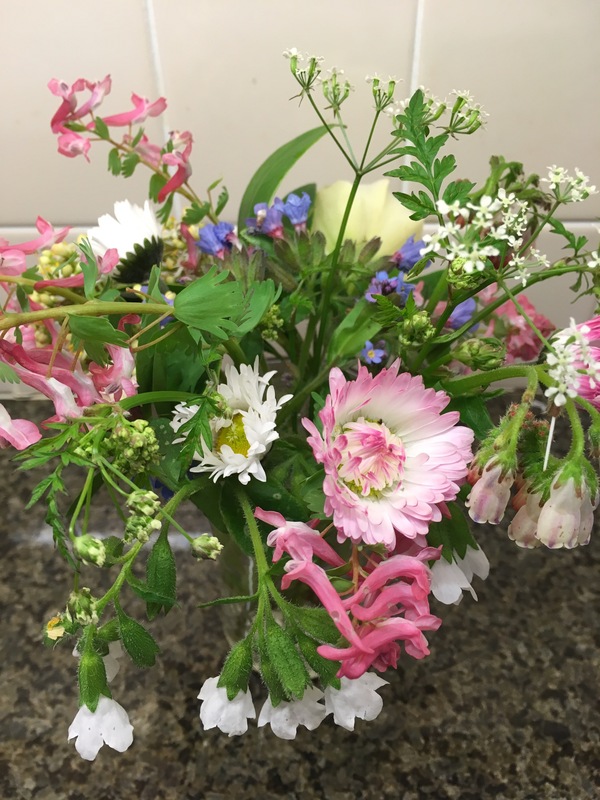 For the dining table posies, delicate Victorian glasses were filled with Sissinghurst white pulmonaria, bellis daisies, comfrey, cowparsley, and pink corydalis. 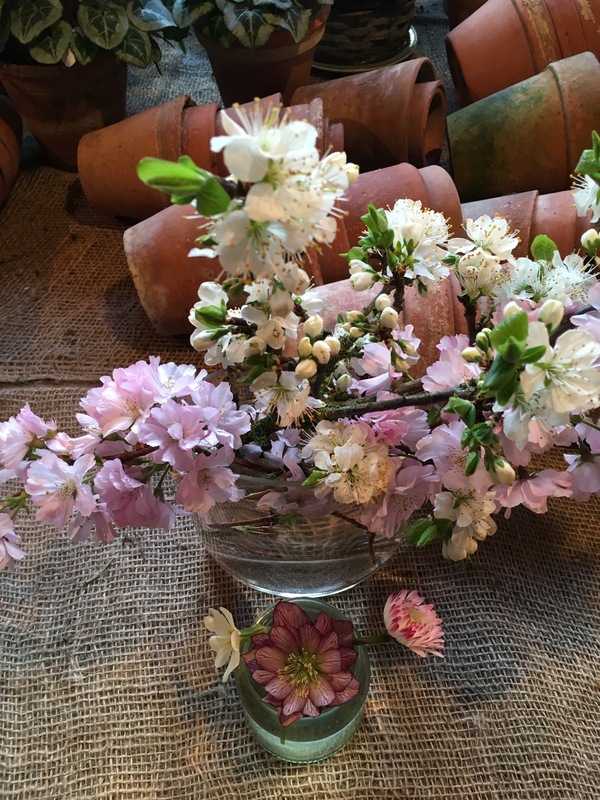 And lots of glass jars of pink and white blossom. 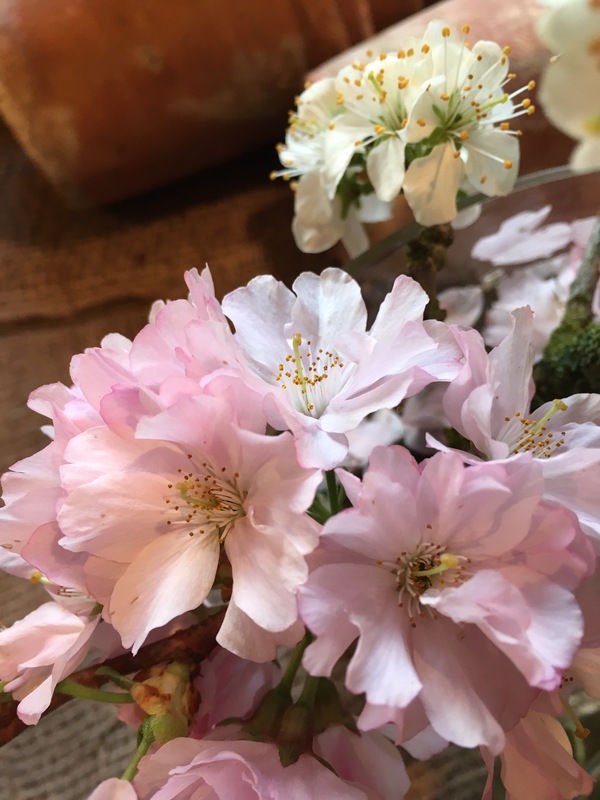 You can never have too much blossom…..
Do you like making flower arrangements for special occasions at home? Many thanks to Cathy at Rambling in the Garden for hosting this meme. Each week Cathy encourages us to go out into our gardens and find material for In a Vase on Monday. Cathy is celebrating her 5th anniversary of blogging today. She was one of the first people I followed on here, and I’ve really appreciated her helpful support and advice from the start. Finding friends and sharing ideas and information is for me, the best reason for joining in. I can see that the flowers are lovely even through the blur! Happy birthday to your youngest daughter! I have just come from blogger, I don’t think it compares to WP. What a lovely way to celebrate a birthday; especially when it coincides with the beginning of spring. All your creations are simply gorgeous! Your beautiful kokedama bouquet has made brought a smile to my face too, what a lovely way to celebrate your daughter’s birthday and the arrival of spring. Beautiful job!!! Happy Birthday to your dear daughter! Hope you both have a wonderful day! Glad she had a great birthday! Lovingly crafted presentations. Spring has definitely sprung at your end of the world! Thank you for your kind comments. Well, the flowers say it’s spring, but on the second day of the vernal equinox we’ve had sleet, hail and high winds. Brr, and cold temperatures. There’s an old country saying, as the days lengthen, the cold strengthens. It seems to be true. Thanks again for reading and commenting. The Kokedama bouquet was a great idea and turned out beautifully. I will have to try one! Happy Belated Birthday to your daughter. Thank you! Do have a go. It’s so simple. Just make sure the moss is really soaked, then it will hold together and hug the jam jar or plastic cut off bottle. I wound the string over the top of the “nest” and the string helped to hold the flowers in place so they didn’t flop over in the wind. I’ve decided to make some more as proper nests for wrens in the garden. Might give them a head start anyway. Or if not, they will have somewhere snug to roost. At the moment they are roosting over my greenhouse door. I’m having to tap on the glass before I go in, and they all fly out in a row! It’s a shame to disturb them. 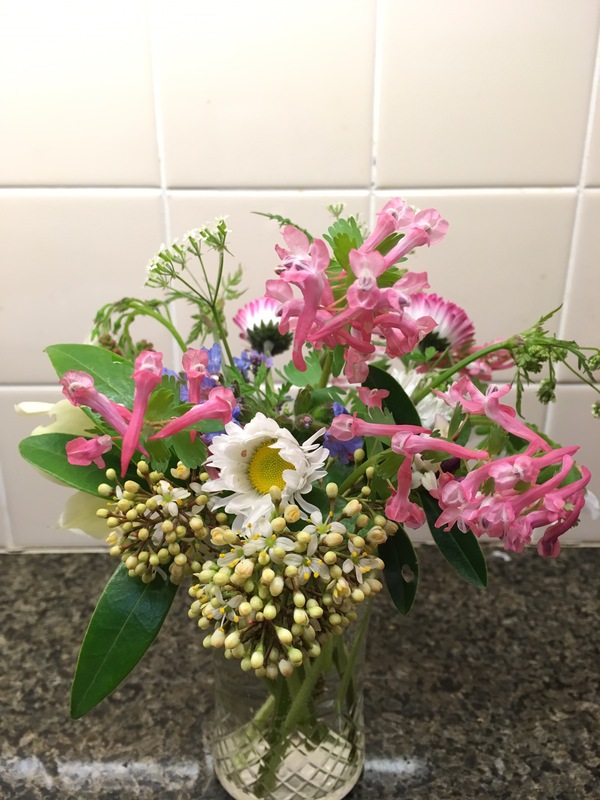 I’ve just discovered your lovely blog and thought I’d drop by to say hello and tell you that I enjoyed your beautiful arrangements. And, how right you are! There is never enough blossom. Just gorgeous! Such beautiful arrangements! I bet your daughter felt very loved and special with these on her birthday. 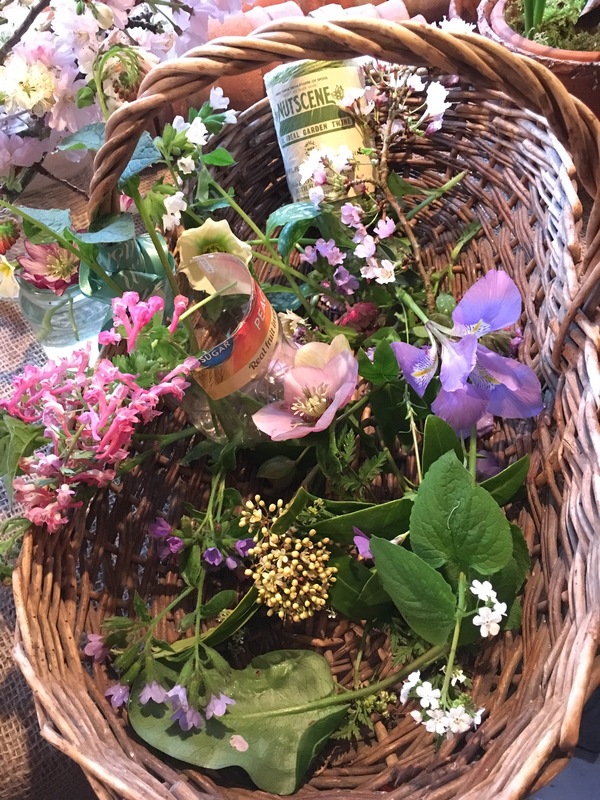 Thank you for sharing how you put it together with the moss and string – the woodland result is lovely! I think your sweetpea posies will be just as gorgeous for market. I’m impressed by your gardening and flower araanging skills, but even more by your innovation. Lovely arrangement. You have made a really special effort for your daughters birthday. What a wonderful way to mark your daughter’s birthday! I love the willow heart kokedama but the flowers for the table are also beautiful. How I wish I could grow Corydalis! I am on catch up this morning Karen so only just reading this.what a pretty selection you have pulled together. Love the colorful variety! Very pretty!